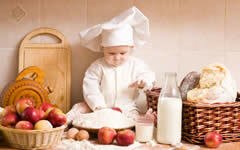 Pregnancy and Kids: What foods should eat your children? What foods should eat your children? Life in modern times takes place very quickly. Sometimes you just do not have time to prepare a healthy and quality food. Fortunately, all children love french fries, hot dogs and pasta. Today is the right time to ask yourself how your child eat healthy? According to some research, children over 15 months, several times a week to eat french fries. The truth is that is made from potatoes, but not so healthy. Raising a child is a very demanding and stressful. The problem is not your child from time to time to eat french fries, but the problem is that from an early age acquire unhealthy eating habits. When a small child in a child should learn to eat healthy foods, would later observe their good habits. Kids do not eat enough fruits and vegetables. Almost half of the children in the period of 1 to 2 years did not eat vegetables and fruit for lunch and dinner. Let your child learn to love fruits and vegetables at an early age. Brunch is a very important meal. Children have a small stomach, which limits food intake during a meal. For that reason, brunch is very important in the diet of children. Snacks that children eat a lot of it comes down to snacks, chips, sticks, candy, crackers, cookies. Instead of the above nonsense, offer your child a fruit or cheese. Do not suddenly throw "junk" food to your table. Try to gradually put more and more healthy food on your table. From day to day, bad habits will slowly change. When you gradually replace unhealthy foods with the healthy ones, your child will not be sad, because you denied him favorite sweets and will positively respond to change. Kids are very picky when it comes to food. Offer them the most diverse food should taste keeps changing. In such circumstances, when they l grow up, they will eat a variety of foods. Do not force your child to eat foods you do not like. Let them decide what they want to eat. Show enthusiasm when the variety in the diet is concerned. Proper nutrition is extremely important for children's development. Many parents are constantly overworked, exposed to anxiety and stress, and even yourself eating junk food. Eat fruits and vegetables. Drink healthy juices and milk instead of soft drinks. Children imitate their parents. A healthy diet will have a positive effect on you and give you the energy to follow the pace dictated by your children. If your child will not eat certain foods, try again! Some studies have shown that a new food must be served from 8 to 15 times before a child is accepted. Only 6 to 9% of parents offer new foods at least six times.Relying on a proven routine that you know the child likes, is certainly easier, but it reduces the chances that your child acquire proper eating habits. Oznake: kids and food, What foods should eat your children?